The "Modern Farmhouse" lifestyle collection. KNOXVILLE, Tenn. – Brown Squirrel Furniture is bringing four new lifestyle brands, a café and boutique to its store with its latest remodel to help further customer experience and product visualization. The remodel, the store’s second in a three-part project, brought the family owned retailer’s showroom space from 70,000 square feet to 92,000 square feet. To complete the project, Brown Squirrel teamed up with designer Connie Post, who worked with them on the first remodel, to create modern farmhouse, mid-century modern and Amish solid wood inspired lifestyle collections. The new lifestyle collections feature elements like freestanding barn doors and whitewashed brick walls. Large murals of Knoxville from local photographer Bruce McCamish and decorative signage denoting the different collections all act as callbacks to the themes and Brown Squirrel's history. 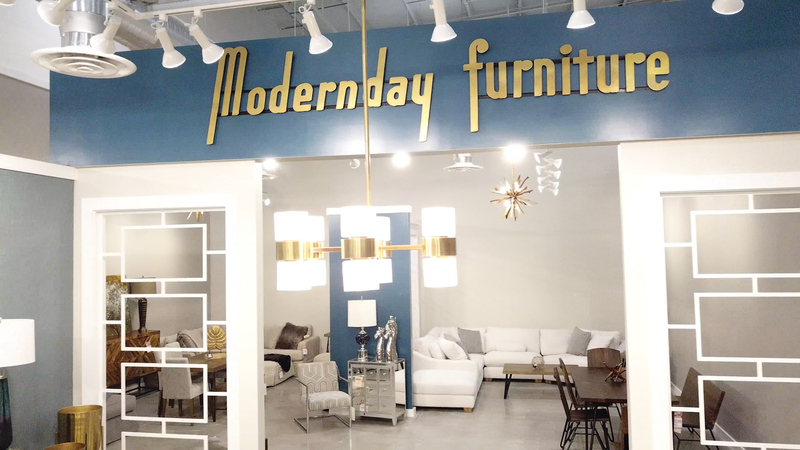 One sign, which points out the Mid-Century Modern “Modern Day” collection, is actually an original from Modern Day Furniture, Matthews’ father’s first furniture store that he founded 20 years before opening Brown Squirrel. "We are a part of this community, and they support us, so we try to stay true to it," Preston said. The "Modern Day Furniture" sign is an original piece from Matthews' father's first furniture store. In addition to the display expansions, Brown Squirrel also added amenities like a café and boutique to the store. In “Renee’s Retreat and Gift Boutique,” named for Matthews’ wife, clothes, accessories and locally made candles and art are for sale. At the café, baked goods, coffee and other foodstuffs are for sale in a bistro setting. For Matthews, all of these elements are a part of making customers comfortable and helping them visualize showroom product in their own home. This renovation marks Brown Squirrel's official transition from a Levitz-style warehouse showroom location to a strictly showroom space. Matthews said he chose to move Brown squirrel's in-house warehouse to a repurposed factory across town so that the store could use the space to expand the showroom. The transition of the space was necessary for Brown Squirrel, Matthews said, because the company is surrounded on three sides by HGTV’s headquarters campus, which limits Brown Squirrel’s ability to build new warehouse space. 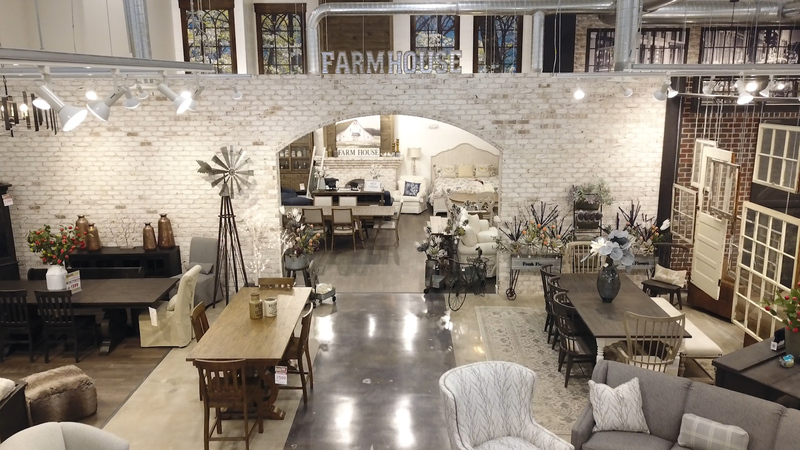 Looking ahead to the third part of the renovation, Matthews said he has plans to raise the ceiling in the original 48,000-square-foot portion of the showroom to 20 feet to help match the high ceilings of the converted warehouse space. Additionally, Matthews said he would like to modernize the layout of the older portion of the showroom to make it easier to navigate. Matthews did not confirm a date for the next step in the remodel but did say that Brown Squirrel is taking its time with the remodel to keep from overextending itself. “I learned from my Dad to invest within your capabilities in case there is a downturn, which there will be,” he said. With this new remodel, Matthews said that he expects to see anywhere from a 30% to 40% increase in the store’s current volume, so long as the store is able to merchandise and market their new concepts and offerings. To get customers in the store to see the changes, Matthews said Brown Squirrel will be giving away memory foam pillows to the first 100 customers through the door and hosting several sales and a $50,000 furniture giveaway during its grand opening.